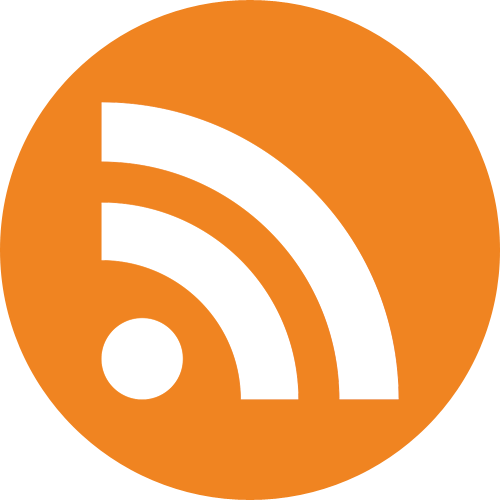 Welcome to our new Weekly Roundup in which we will conveniently cover the past two weeks as there hasn't been an awful lot going on in the public lives of the Grand Ducal and Princely families. The most important news upfront: Grand Duke Henri was hospitalised last Saturday but his health has been improving. Meanwhile, we haven't actually seen any of the Luxembourgs in the past two weeks. Grand Duke Henri and Grand Duchess Maria Teresa did sent letters of sympathy to the President of France and the Archbishop of Paris following the Notre-Dame fire though. The Grand Duchess is the patron of one of the new bells of the Cathedral installed a couple of years ago. Meanwhile the Liechtensteins continued celebrating the 300th anniversary of their Principality this year with a visit to Berlin. 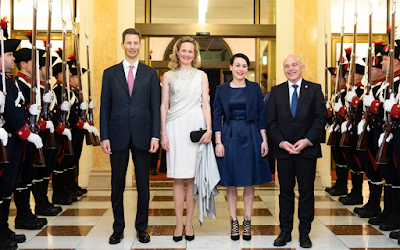 The Liechtenstein embassy in Germany hosted a reception on April 11 that was attended by Hereditary Prince Alois and Hereditary Princess Sophie, who were joined by the Prime Minister of Liechtenstein as well as the Presidents of Parliament of both Germany and Liechtenstein. More pictures and information at Volksblatt. On April 14, Princess Marie celebrated her 79th birthday. The Liechtenstein government and several other dignitaries were on hand to offer their best wishes during a reception hosted at Schloss Vaduz. Fürst Hans-Adam II was also there though the pictures available don't quite tell if any other family members were in attendance. And with that, Team Luxarazzi is wishing all our dear readers a wonderful Easter weekend! The health of Grand Duke Jean is improving, the maréchalat de la cour has announced. Luxembourg's former Grand Duke was hospitalised on Saturday following a pulmonary infection. While the health of His Royal Highness has improved, he will remain in the hospital for observation by the doctors. Grand Duke Jean turned 98 earlier this year. Grand Duke Jean has been admitted to hospital following a pulmonary infection, the maréchalat de la cour has announced. Luxembourg's former Grand Duke, who turned 98 earlier this year, is under observation by the doctors. No further details on his current health was shared. We last saw Grand Duke Jean attending an event about two weeks ago. 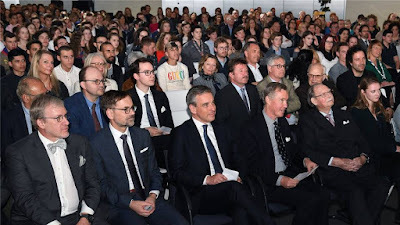 Catching up a little from last week, on March 28th Grand Duke Jean attended the presentation of the Insignes du Mérite Jeunesse, 250 to be exact. He was accompanied by his youngest son Prince Guillaume and granddaughter Princess Charlotte. Among the winners were two young men who were awarded for their project "The Luxembourgish Peanut Butter," which raised funds for charity. 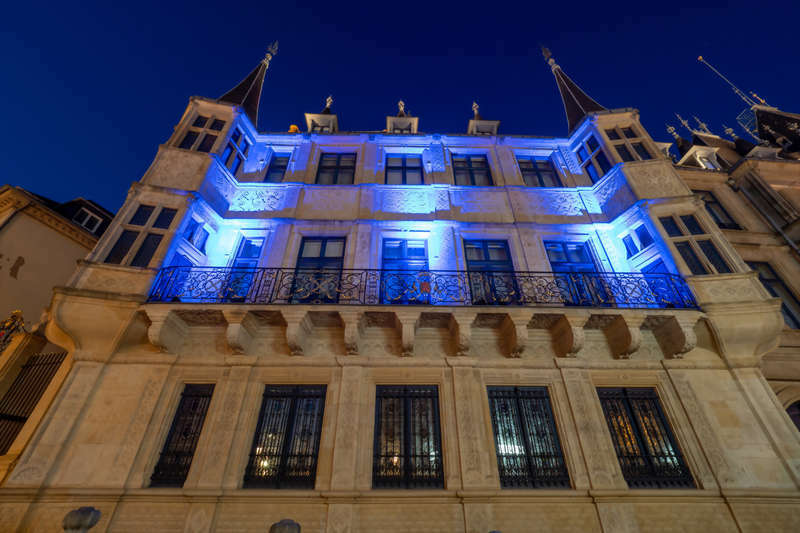 From March 30th through April 5th, the front of the Palais grand-ducal will be lit with blue light as part of "Light It Up Blue," a movement that raises awareness about autism. Grand Duchess Maria Teresa is the patron of the Fondation Autisme Luxembourg. On March 29th, Hereditary Prince Alois honored Liechtenstein's 300-year anniversary by attending a Liechtenstein Day event in Bendern, hosted by the Ospelt Group. 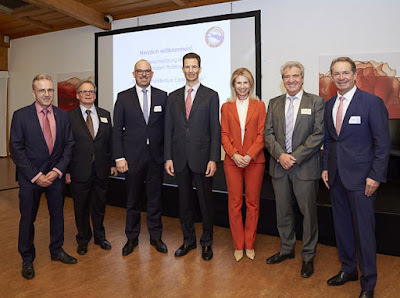 On April 2nd, Prince Nikolaus was present for an event hosted by the International Liechtenstein Press Club (LPC), with the focus around the international perception of the Principality. In the 1970s, Liechtenstein was known mostly for ski slopes and stamps, although the perception has since expanded to include banking at the Princely family. 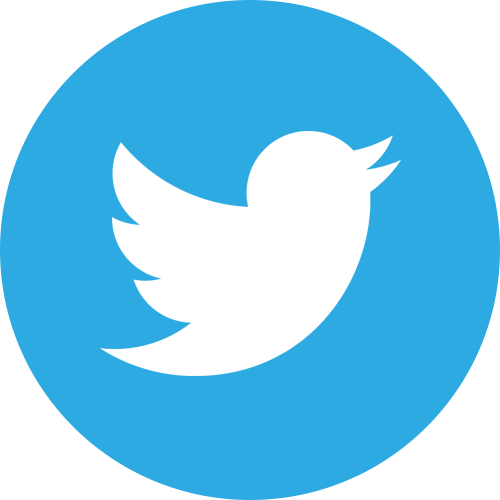 And...you might have noticed that the blog was a little busier this week, with several other posts added. Hereditary Prince Alois and Hereditary Princess Sophie were in Switzerland for a state visit: Day 1 and Day 2. (Alas, no tiaras.) Additionally, a British judge dissolved Prince Louis's marriage to Tessy Antony, so they are now officially divorced. Her title is in transition. The cour grand-ducale announced today that "the divorce between Prince Louis and Mrs Tessy Antony was pronounced on April 4, 2019" confirming yesterday's reports. Contrary to the House Law of the Grand Ducal Family, the former wife of Prince Louis spoke to RTL sometime yesterday saying that she would continue to use the title of "Princess of Luxembourg" until September and then would go by the name "Antony-de Nassau" combining her maiden and married names. The cour half-confirmed the statement today saying, "for the sake of the children, Their Royal Highnesses the Grand Duke and Grand Duchess granted to Mrs Antony the favour of adding the name "de Nassau" to her name. She will be called Mrs Tessy Antony-de Nassau from September 2019. As the result of the divorce Mrs Antony-de Nassau loses her predicate Royal Highness and the title "Princess of Luxembourg". She will not represent the Grand Ducal Family any longer." To which I ask: How are we supposed to call her in the meantime? She's not a princess any longer but she will only start using her new name in September?! Is she not technically a princess anymore but we are still supposed to call her a princess? But why don't you call it a princess in your announcement then? And, finally, why have a House Law regulating names, styles and titles in the first place when play it by ear at any chance you get?! Welcome to the oftentimes messy world a Luxembourg titles. Anyway, in the end Team Luxarazzi wishes Prince Louis and the still but possibly not really Princess Tessy all the best for their future lives - and we hope that both of them will continue to remain "a wonderful team", as Tessy put it, always putting their children first. The Liechtensteins may be doing a state visit for once but they are still not into the tiara business, it seems. So last night's gala dinner, which rounded off the first day of Hereditary Prince Alois and Hereditary Princess Sophie's visit to Switzerland, was a bit anti-climactic with yours truly still searching for the gala in the gala dinner. More pictures of last night's 'business' dinner at Vaterland. 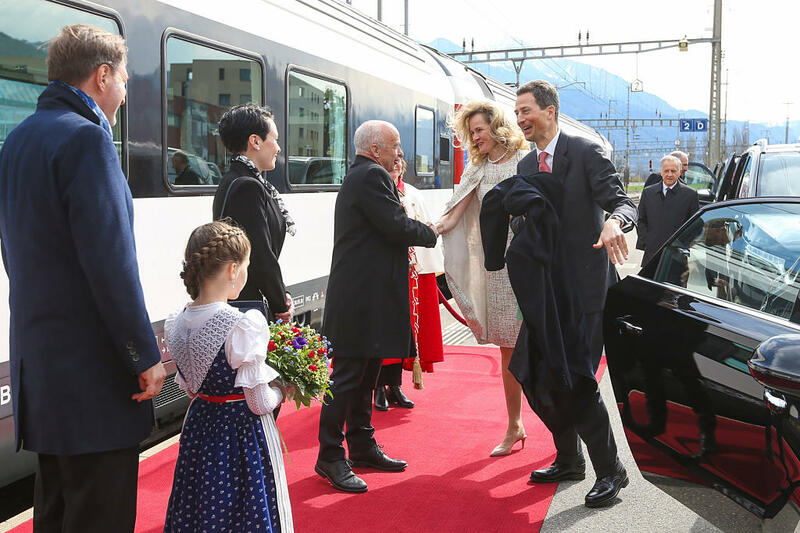 The second day of the state visit led the Hereditary Prince and Hereditary Princess and their hosts President Ueli Maurer and his daughter to Lausanne in the French-speaking part of Switzerland. 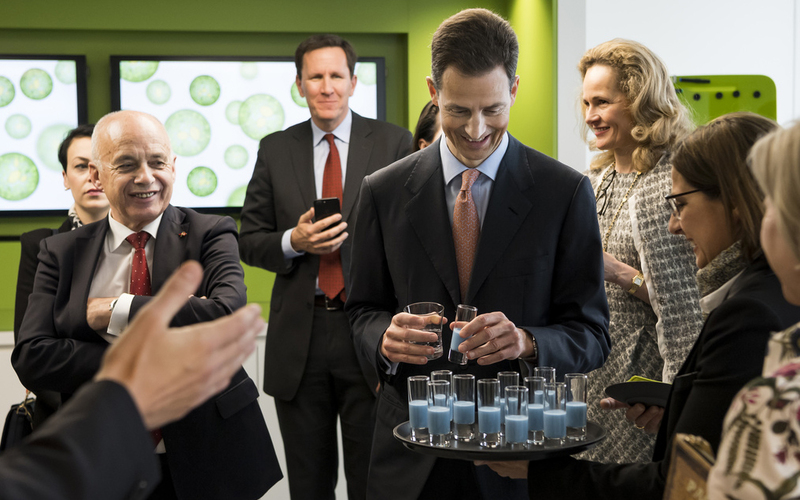 The day was headlined "Research and Innovation" and thus they paid a visit to the Swiss Federal Institute of Technology in Lausanne (EPFL) as well as the Nestlé Research Centre where everyone tried slightly blue-looking vegan milk made of microalgae. The day ended with a boat tour on Lake Geneva to Vevey. A video of the day' events at Volksblatt. Prince Louis and his now former wife Tessy Antony were officially divorced today. Mr Justice MacDonald pronounced a 'decree absolute' at a hearing in the Family Division of the High Court in London today, according to press reports. The former couple announced their decision to end their marriage more than two years ago in January of 2017. For the past two years, Prince Louis and Tessy Antony could not reach a financial settlement meaning that their divorce could not be finalised. It was since ruled by the High Court that Prince Louis should pay £4,000 child support for each of their sons, per year. The judge also ordered that his former wife and children should be given a "licence to occupy" the former family home in London "until the youngest child finishes his first degree". The Grand Duke previously let the court know that he would cover any of his grandchildren's schooling fees and health related costs. In general the High Court ruled that the Grand Ducal Family's wealth could not be factored into the divorce but that any child support would be based on Prince Louis' own earnings. In accordance with the House Law of the Grand Ducal Family, the former Princess Tessy lost her title as Princess of Luxembourg, Nassau and Bourbon-Parma when the divorce became official. Going forward, we will make note of any of Tessy Antony's appearances at events of the Grand Ducal Family but will not cover her public and private lives any further. This week marks a very special event in the history of Luxarazzi: While it's been six years to the month that we added the Princely Family of Liechtenstein to over coverage, we now have our very first Liechtenstein state visit on our hands as Hereditary Prince Alois and Hereditary Princess Sophie are currently in Switzerland at the invitation of the Swiss Federal Council. As the Principality is such a small country and doesn't have very close diplomatic ties with very many other nations, don't hold your breath for this to become a regular occurrence though. Even state visits to Liechtenstein's closest ally, Switzerland, are few and far in between: In 1970, Prince Franz Josef II and Princess Gina paid a state visit, as did Prince Hans-Adam II and Princess Marie in 1990. The state visit kicked off earlier this morning, when Hereditary Prince Alois and Hereditary Princess Sophie were met by Swiss President Ueli Maurer and his wife at the train station in Sargans, a small Swiss town of the border to Liechtenstein. The Hereditary Princely Couple is accompanied on the state visit by Prime Minister Adrian Hasler, Deputy Prime Minister Daniel Risch, basically the whole government, the President and members of Parliament. Together they boarded a train to head to Bern, the capital of Switzerland. While on the train, the Liechtenstein delegation and their Swiss hosts had luncheon together. After the arrival at the train station Bern, the Hereditary Prince and Hereditary Princess were greeted by local dignitaries and a children's choir before making their way to the city centre to sign to golden book of the Swiss Federal Council. At 3pm, the official welcome, including military honours, national anthems, a review of troops and a presentation of the respective delegations, took place at the Münsterplatz. 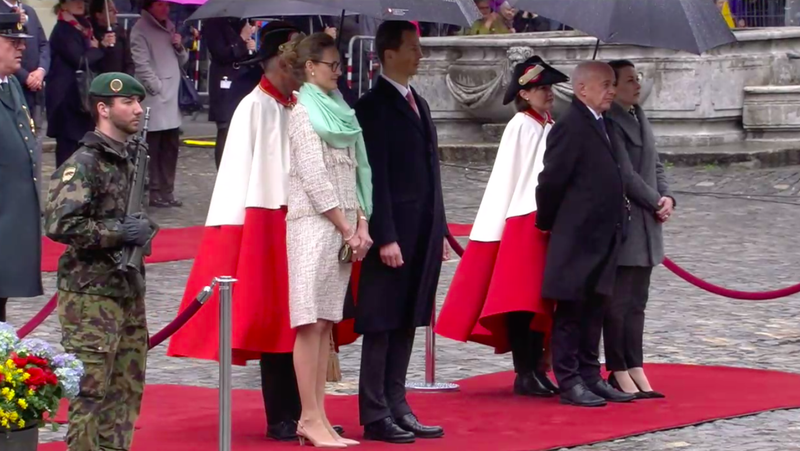 The Hereditary Princely Couple and the President and his wife then braved the stormy weather and took the chance to chat with some bystanders. Next up on the day's agenda were speeches by Hereditary Prince Alois and President Maurer at the town hall in Bern. 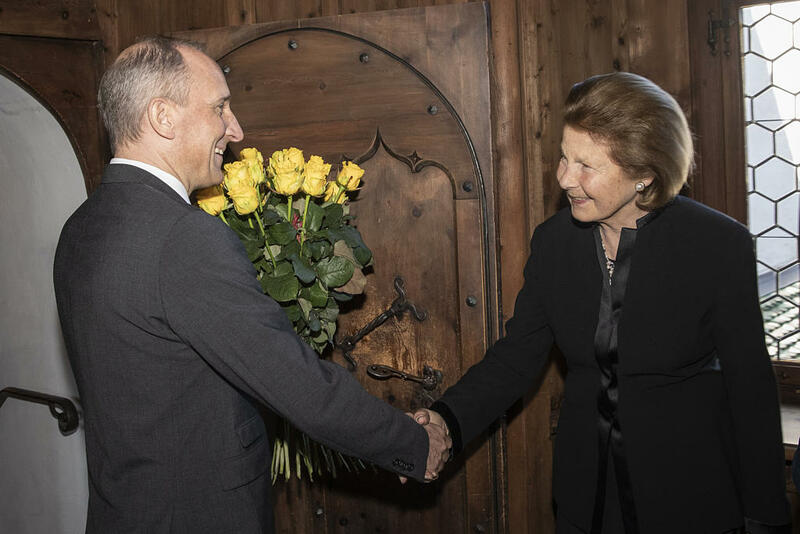 Both of them spoke of the close ties between the two nations as this year actually marks the 100th anniversary of the beginning of diplomatic relations between Liechtenstein and Switzerland. In 1919, the Principality established the first diplomatic mission in Bern. 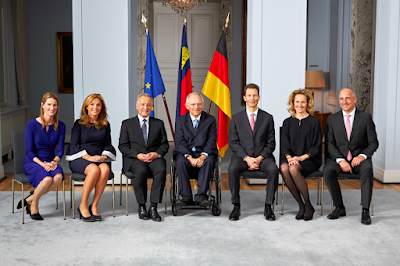 For 100 years now, it has also been Switzerland that has represented Liechtenstein diplomatically in all countries where the Principality does not have its own ambassador (so practically everywhere but Austria, Germany, the Czech Republic, Belgium and the United States). Afterwards, bilateral talks were held between the Liechtenstein and Swiss delegations. The afternoon events were rounded off by a press conference held by the Hereditary Prince and President Maurer where both of them, once again, spoke of the close ties between the two nations, the easy cooperation and how both countries can keep learning from each other. Meanwhile, Hereditary Princess Sophie paid a visit to the 'House of Religions' in Bern. As of the publication of this post, the gala dinner in honour of the Hereditary Prince and Hereditary Princess is taking place. No pictures or information as of yet, whether there will be a tiara. Personally, I'm not holding my breath but let's wait and see - we will keep you posted in the hours to come! In the meantime, more information, photos and videos of the day can be found at Vaterland #1, Vaterland #2 and Volksblatt. Swiss TV SRF also has a lengthy special about the day with several news clips. 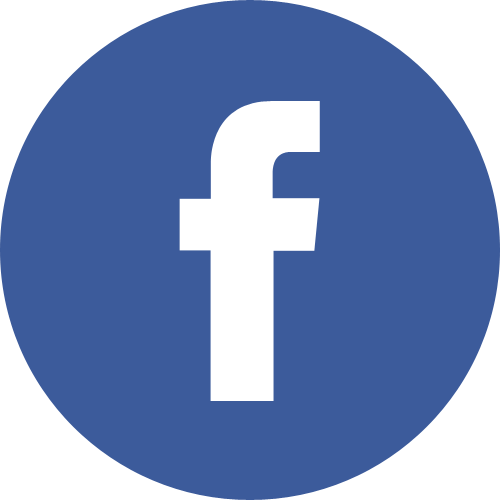 Luxarazzi turns ten this year, Luxarazzi 101 has been around for about seven years - see all our plentiful posts here - and so there aren't very many jewels left for us to have a closer look at. While we admit that all of Team Luxarazzi gets distracted by sparkling objects rather easily, there is also a deeper reason we like royal jewels so much: These tiaras, necklaces, earrings and brooches oftentimes tell fascinating stories, help you to trace history and show the connection of royal families. Just think of this diamond and pearl brooch that has been owned by at least three reigning European families, Queen Victoria Eugenia's Aquamarine Tiara or the Habsburg Fringe Tiara. Back in the day, when royal ladies married into other houses, they brought along some of their family's sparkling jewellery. While we don't see that as often anymore these days, there are still a few examples. 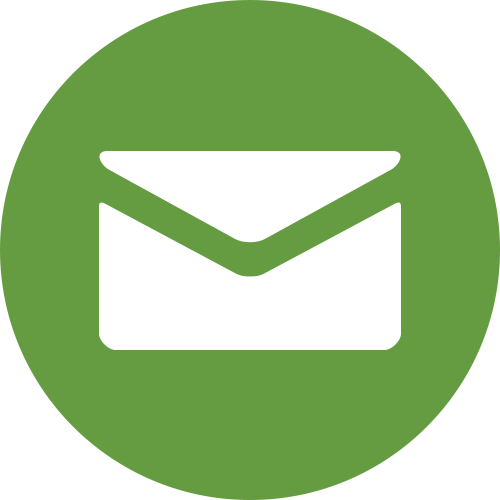 Cases in point: Both Hereditary Princess Sophie of Liechtenstein and Hereditary Grand Duchess Stéphanie of Luxembourg, who are both of royal/noble descent. While yours truly hopes that Sophie is one day in the hopefully distant future set to inherit her mother's Douglas Floral Tiara, we are going to have a closer look at a sapphire and diamond demi-parure already owned by the Hereditary Princess, who was born a Duchess in Bavaria, today. Truth be told though, we don't actually know for a fact that the necklace and earrings, which can be worn in at least two different settings, has been in the Wittelsbach family before Sophie married Hereditary Prince Alois. However, with the depth of their jewellery collection, it is not hard to imagine. The Hereditary Princess first wore the demi-parure for her pre-wedding ball at Schloss Nymphenburg in 1993 together with the Bavarian Pearl and Diamond Floral Tiara. Since then, she has oftentimes worn the pieces consisting of a single sapphires each surrounded by diamonds for events that required some major bling yet no tiara. And who knows, maybe we will see the pieces again later this week as there is a very rare royal event coming up: A Liechtenstein state visit... So keep your fingers crossed for these (or any, really) major jewels! And if you would like to keep yourself busy with some more jewellery while we wait for the state visit to Switzerland, check out this documentary on the jewels of the Wittelsbach family, which includes interviews with Sophie's father, Duke Max in Bavaria, and also her uncle Duke Franz of Bavaria. "Everybody can be a Princess. It is something you fell and express by your actions and words. 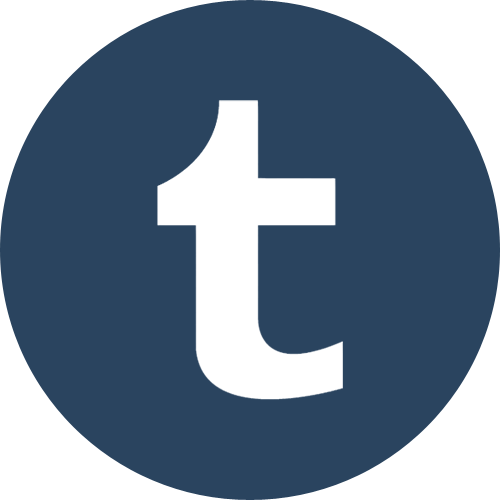 Not by a name given to you", Tessy writes - and while I am sure it was well intentioned, it just somehow rubs me the wrong way. No, not everyone can be a princess. It is not a name (unless you live in a former monarchy where titles became part of a legal last name). Instead, it is a title - and it is not even a title that someone attains by their own accomplishments, but a title someone has by the virtue of their birth or by marrying someone. Considering we live in the 21st century, I would classify neither as an achievement. Being a princess doesn't make you a better human being either. It is who you are as a person who makes you a better human being, but still not a princess. Let's face it, the whole point of it has always been privilege and elitism. If everyone could be a princess, what is the point of being one to begin with? Be defined by yourself and your own actions and not a title bestowed on certain people based on the luck of their birth or marriage. Apart from a possible superficial first attraction to your title, it doesn't make you an interesting person. It is what's beneath that counts. I also keep wondering: What is the obsession with being a princess to begin with? If these ranks are achievable, I would want to be a Queen, thank you very much. Or better yet, an Empress. A Grand Duchess, a Landgravine, the Princess - someone who rules the world (or a tiny part of it) in her own right. Not a princess, which just means being the wife or daughter of someone without any actual power whatsoever. We live in the 21st century, it is time we stop defining women by being someone else's mother, wife or daughter. Young girls should dream of and aspire to be the woman who rules the world, not the wife or daughter of someone who does. With fairytales and Disney omnipresent, it is not hard to imagine where society's obsession with being a princess comes from. It’s something easy to daydream about: The prince on a white horse who comes, sweeps you off your feet and takes you to his fairytale land and you live happily ever after. However, that isn't the reality of life - and frankly it would be a pretty boring one at that. Perhaps someone should write the story about Cinderella ten years on, with five kids, stretch marks, a whining staff, and she and Prince Charming having the same argument they've been having for a decade?! So in the end, I can't help but I think if the desire to "be a princess" by grown women is also actually an unstated preference for having a life of ease and privilege with very little responsibility. And that's hardly something for young women to aspire to. It's like striving to be famous instead of striving to be talented. So to all the girls and women out there: Be the Queen, be the Empress, rule the world!